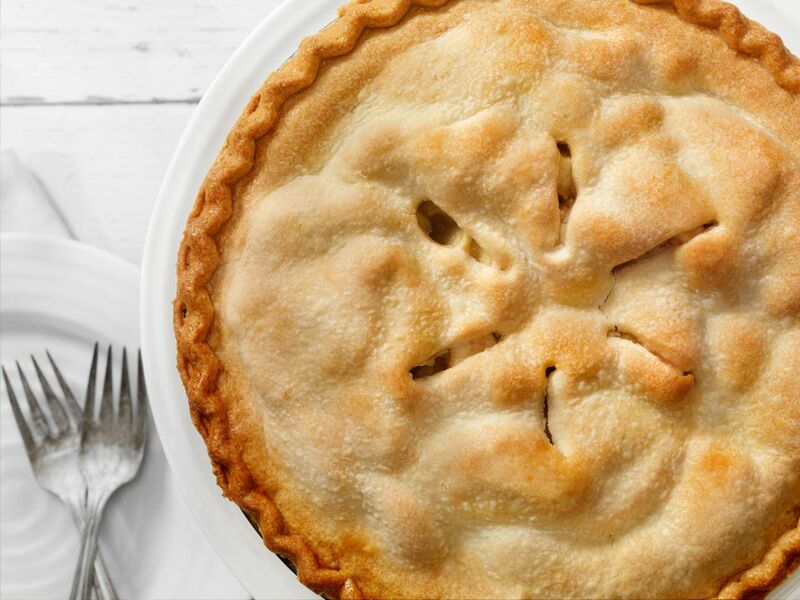 Baking pies is one of the few situations in the culinary arts where it's okay to vent. We're not talking about kitchen rage, though, but rather, those insignificant-looking holes or slits in the top crusts of a double-crust pie. They might seem merely decorative, but they actually serve a critical purpose. Those openings are called pie vents and they are openings in the top layer of the crust of a double-crust pie (which is a pie with a layer of pastry that covers the top of the pie, as opposed to just a bottom crust underneath a filling). Pie vents allow the steam produced by the filling during baking to escape. Obviously, you don't have to worry about them if you're baking a single crust pie or an unbaked pie like a cream or chiffon pie. Ideally, pie dough is a delicate, almost crumbly pastry that just barely holds together. It's not particularly elastic, like pizza dough or bread dough. If you try to stretch a piece of pie dough, it'll break. And that's the way you want it. Brittle, breakable pie dough will produce a light flaky crust. It should be as inelastic as possible while still holding together. So far, so good. But when a pie goes into the oven, the filling starts to boil and produces steam. When water turns to steam, its volume can increase up to 1,500 times. That means even a pie filling made only of fruit with no added liquid can produce a substantial amount of steam. Baking a double-crust pie with no vents will likely cause the top crust to rupture because it can't stretch. Bubbly pie filling will seek out the weakest point, which is where the crusts are crimped together, and you'll have fruit juice and bits of fruit shooting out the side of your pie and all over the bottom of your oven. Remember, too, that steam isn't merely a pressurized gas, it's superheated water vapor. Thus, it will not only cause structural damage, but that excess liquid will also make the top crust soggy while causing the filling to turn out more on the soupy side. Vents Also Prevent "Pie Gap"
"Pie gap" happens when you bake a pie with a filling like apples, where, because they shrink so much during baking, you have to start with a veritable mound of uncooked apples. With no pie vent, the apples shrink down, but the crust retains its original shape, producing a wide gap between the crust and the filling. Venting lets the crust settle as the apples shrink, so you don't get "pie gap". Fortunately, it's easy to create vents in pies. The simplest way is to use a sharp knife to cut slits in the top crust. Four or five (2-inch) slits, arranged circularly, radiating from the center toward the edges, should be plenty. You can use your finger to widen the slits slightly. If you're more ambitious, use pastry cutters to cut decorative or geometric shapes—stars, hearts, flowers, diamonds, and so on—into the top crust before draping it over the pie. If you do this, you can arrange the cut-out pieces of dough attractively on top of the crust, affixing them with egg-wash. Bonus: You can use these openings to test whether the apples in your pie are tender. Pie birds are a cute baking accessory that are perhaps more traditional for venting meat or chicken pies, but they'll work for fruit pies as well. Pie birds are hollow sections of ceramic that are shaped like birds, with a hole in the opening of the bird's beak that allows steam to vent. You'd position the pie bird in the center of the pie, arrange the filling around it, then cut a hole in the center of the top crust and drape it over the top with the hole positioned over the bird's head. The advantage of the pie bird is that in addition to venting steam, their tubular structure allows some of the liquid in the filling to bubble up into the bird instead of spilling out onto the pie. The downside is that they can be a bit large, and so they take up space in the pie. A cinnamon stick! Perfect for apple pies. A funnel made of a rolled up piece of parchment. An upside down metal pastry tip. Pieces of hollow pasta like ziti, penne, or cannelloni.